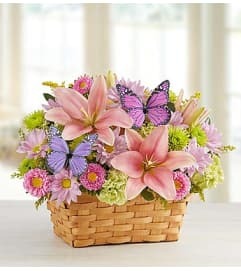 Spring smiles are sure to hatch when you send this truly original Easter arrangement. Vibrant multicolored roses, reminiscent of pastel Easter eggs, are hand-designed in a charming bird’s nest basket, accented with a bright ribbon and festive plastic Easter eggs. 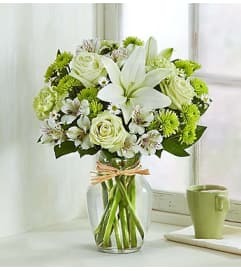 A terrific centerpiece arrangement or hostess gift. 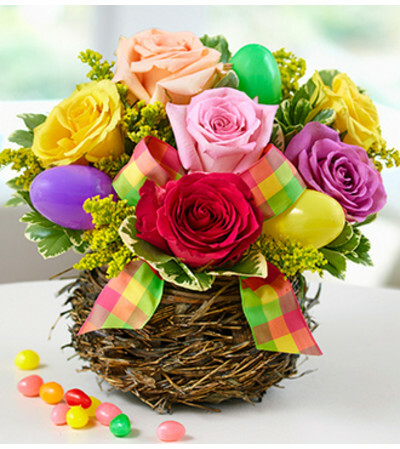 Assortment of fresh multicolored roses, gathered with solidago and variegated pittosporum.